At Proton Services Incorporated, we are the best at what we do, yet we manage to maintain reasonable rates – a fraction of what OEMs charge. Our contract rates, uptime record, and quality of service are unmatched, and detailed service reports of every visit are kept in on-site service books. 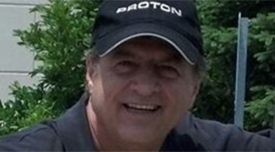 Gary Provenzano, president of Proton, has been servicing MRI scanners since 1983. In 1985, he was the service engineer on the very first mobile MRI, used at JFK Hospital (now HCA) in Lake Worth, Florida. A native of Northeast Ohio, he has been a service engineer with both Cleveland-based imaging companies, Technicare/Johnson & Johnson, and Picker/Marconi (now Philips™). He was also the service engineer on the first Siemens mobile MRI in Ohio, and served in the U.S. Navy, at the NavComActs Naval Communication Station Pacific in Pearl Harbor, Hawaii. Read More about Gary & Proton Services Incorporated. Contact us in Sayreville, New Jersey, for superior imaging equipment repair.